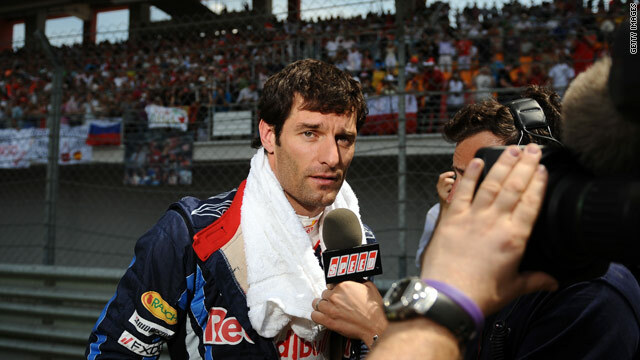 Mark Webber still leads the title race after third place in the Turkish Grand Prix. (CNN) -- Australian Mark Webber has kept his place at the head of the Formula One standings after finishing in third place in the Turkish Grand Prix behind the McLaren pair of Lewis Hamilton and Jenson Button. Webber looked to be headed for this third straight win at Istanbul Park until a collision with Red Bull teammate Sebastian Vettel which caused him to pit for a new nose cone. Vettel went off and did not finish, meaning he has slipped to fourth in a close title race which is dominated by Red Bull and McLaren after seven rounds. Hamilton's victory, his first of the season and first since Singapore last year, has massively boosted his title chances as he moves up to third place. Reigning champion Jenson Button has closed up in second place, five points adrift of Webber, who is bidding for his first crown. Red Bull also lost the lead in the constructors' championship after the disastrous error, with the McLaren one-two leaving them one point ahead. Ferrari, who could only finish seventh and eighth through Felipe Massa and Fernando Alonso, slip to third in the team standings with Alonso also falling off the pace in the drivers' race.